Casa Merry Echevarria y Estelo offers comfortable accommodation, modern and cosy construction. You will have the opportunity to meet some wonderful hosts that will make you feel like family. These will be willing to help you in everything you need during your stay in Viñales. 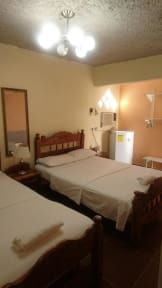 In this accommodation you can enjoy the best Cuban food, delicious cocktails and many other services that will guarantee your comfort and satisfaction during your stay. 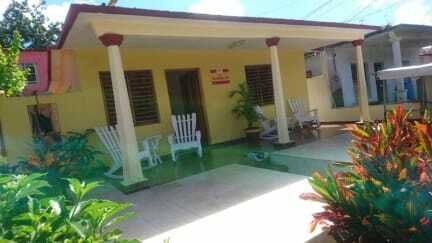 It is located just 200 meters from the center of Viñales, very close to restaurants and emblematic bars of the city and internationally known as Oscar Restaurant, La Cuenca, Reasons, etc. Accessible in any means of transport and parking available. Located in the center of the Valley of Viñales, with panoramic view from the terrace to the mountains and very close to all the services of the city: the perfect mix. The rooms are independent with private entrance, with two large double beds, air conditioning, towels, linens and pillows included, minibar, wardrobe, etc. It has a private bathroom with hot and cold water, with a pressure shower and basic toiletries.